Yury Shulman achieved the Grandmaster title in 1995 and moved to the U.S. four years later to become one of the top American players. Shulman also uses chess for philanthropic causes. 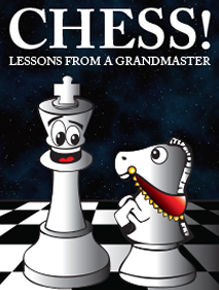 He founded the Yury Shulman International Chess School and consistently contributes to not-for-profit entities, schools and camps. He holds a bachelor’s degree in computer science and an MBA. 2008 proved to be a great year for Shulman: In addition to winning his first U.S. Championship title, he was also part of the bronze medal Olympiad team in Dresden, Germany. In 2009, Shulman represented the U.S. at the World Team Championship in Bursa, Turkey and helped the team earn silver. For the second year in a row, Shulman finished runner-up to GM Gata Kamsky for the 2011 U.S. Championship. You wouldn’t expect former U.S. Champion and Olympic medallist, Yury Shulman, a comp-sci and business graduate to be superstitious. But he raves about the “lucky car” at the 2006 U.S Championship in San Diego. He drove to the tournament each afternoon with soon-to-be-champions, Alex Onischuk and Anna Zatonskih. Yury won his 32-player group and Alex won his, resulting in a friend vs. friend battle. Why did Yury lose? Probably because he sat in the back seat on the ride to the final. Yury’s moment at the top of the crosstable came soon enough. In the 2008 U.S. Championship in Tulsa, Oklahoma, Yury netted clear first with uncompromising play, and he fell just short at the 2010 U.S. Championship, finishing second to GM Gata Kamsky. Yury moved from his native Belarus to the United States in 1999 to attend University of Texas at Dallas (UTD), a three-time national championship college team. UTD takes chess very seriously. In addition to offering scholarships to top players like Yury, UTD wants to see chess taught in elementary schools across the country. Although Yury’s second-place finish in the 2006 U.S. Championship was a surprise to most fans, those who followed his performance in the 2005 World Cup in Russia weren’t surprised at all. Yury went up against some of the top players in the World in this knockout tournament and defeated three higher rated GMs to advance to the round of 32, including a very impressive victory over former FIDE World Champion Alexander Khalifman. Despite eight other Americans competing in this event, only Gata Kamsky was able to advance further than Shulman. Shulman also coached the 2006 Women’s Olympiad team in Turin to an impressive fourth place finish. In 2008, Yury joined the men’s Olympic team and helped lead them to a fantastic bronze medal finish. Yury scored the final clutch win over Ukraine’s board four, Efimenko to clinch bronze.